City of Assisi is famous with the Papal Basilica of San Francesco d'Assisi, which is the main church of the Franciscan Order. In addition to this major tourist attraction Assisi is a very interesting place for tourists with its two castles - one is smaller and partly open to visitors and the second is the first thing one sees when approached this Italian city. Assisi Castle dominates by its high hill overlooking the whole village and today still performs it’s main function, which was built centuries ago, namely - to lay the respect and esteem. Assisi is located in the province of Perugia in the Italian region of Umbria and is today a very interesting and preserved medieval town. 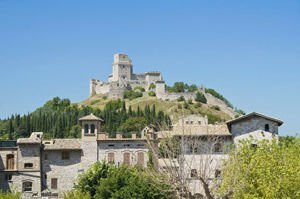 Peak interests are the two castles with a focus on high placement castle Assisi , which is locally known as the Rocca Maggiore or large castle. Castle Hill Assisi has been fortified since ancient times, but the current castle was built by Cardinal Albornoz in the years 1365-1367 on the foundations of an older fort. Compared to other medieval castles and palaces, the one in Assisi is not as big and impressive, but when the cardinal has decided to build up the hill, he had intended to erect a fortified palace, which should inspire respect and obedience among the local population. Rocca Maggiore had some rebuilding and expanded further by Popes Pius II and Pius III. Until 1458 the ruler of Assisi succeeded to finish 12-odd big towers and firewalls, which connects the medieval castle with the town of Assisi . Final stronghold of the castle is completed by then Pope Sixtus IV in 1478. Between the years 1535-1538 Pope Paul III restored the castle again, adding to the structure and the large round tower, built to the main gate. Today, the impressive bastion on the hill of Assisi continues to be one of the biggest attractions of the city. The palace is open for public visits at 10:00 each day until late evening. From the site before Rocca Maggiore opens an amazing view of the local valley of Spoleto and all of Assisi . Tourists have the opportunity to see a little remainder of the former Roman fortress, which stood at the castle Assisi’s place . The palace is well restored in recent years but still retains the atmosphere and the original vision of war bastion. Today the castle is most often used for events and exhibitions. Rocca Maggiore is excellent and a favorite place for walking not only to the visitors but also by its own inhabitants. The palace is easily reached from downtown in a series of well-marked steps.